After her last disaster of a relationship, Ivy Stephens is content being single. She has her job, her apartment-and the cute little puppy she's seen hanging around. When he escapes, she finds her search efforts aided by a big, burly, devastatingly handsome man. One who claims a prior claim on her dog. Sam Hamilton is at loose ends since his best friend fell in love. He finds a sense of purpose in rescuing strays. The puppy who's stolen his heart just happens to run into blond, beautiful Ivy. And Sam can't help hoping she'll take in one more stray-him-for good. Sam Hamilton is a bad boy, or that is what he appears to be to the outside world. But his best friend, Foley, and Foley's mom are his family and have been there for him for most of 10 years. While Sam's birth mother, Louise, only causes him pain, Sam fights to take the anger and pain away. Ivy Stephens is a good girl that has had her share of bad boyfriends. She put her way through massage therapy school and is part owner in a business. Still, her family doesn't care that she even exists. When Sam and Ivy meet looking for a stray puppy, the sparks fly between them. While Ivy is cautious about rushing into a relationship, Sam wants more of what he has never had before and he wants it with Ivy. They spend time together with Cookie, the puppy, and it just makes them want to be together even more. Can Ivy date Sam without rushing in too fast? Will Sam let Louise ruin what is beginning with Ivy? Will Foley and his mom approve of Ivy dating Sam? What happens when Ivy learns about Sam's past? This is the third book in this series and I am loving it and can't wait for the next one. It is about Sam and Foley's mechanic buddy, Lou, and the only woman that hasn't swooned at Lou's feet. 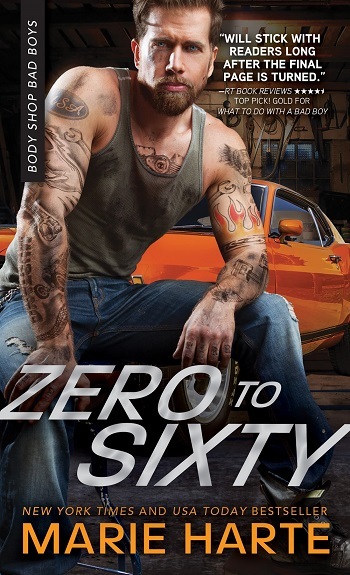 Sam Hamilton is a mechanic with a rocky past and though he looks and sometimes acts like an alpha bad boy, he’s definitely a sweet teddy bear deep down. Sam helps Willie, an elderly and hilarious woman, save stray animals and when a little puppy doesn’t seem to want to stay in one place, it leads Sam to Ivy Stephens’ door. Ivy is a massage therapist who has just gotten out of a rocky relationship. Though the two are attracted to one another, Ivy isn’t willing to get into another relationship. Then the two decide to “split custody” of the stray pup and things begin to heat up. I didn’t much care for Ivy’s character and I think that’s been the strongest factor in my 3-star rating. The writing is good, however, the pace just isn’t there. Especially when scenes from previous characters are thrown in, this is the first book in the series that I’ve read and I think that had I read the previous books this wouldn’t have been so confusing. My favorite part of this book was Willie, each scene that has her in it had me cracking up – she definitely makes this a story worth reading. For reviews & more info, check out our Test Drive post. For reviews & more info, check out our Roadside Assistance post. Reviewers on the Wicked Reads Review Team were provided a free copy of Roadside Assistance (Body Shop Bad Boys #2) by Marie Harte to read and review.